Hardwood flooring is a popular option when it comes to choosing an upgrade for the flooring in your home. This is often because it's easier to keep clean and generally looks neater than carpet or other flooring options. Many tend to prefer what it has to offer. However, between all the hardwood and hardwood look-alike options out there, how do you choose? To help you, this article will offer some solid information on a few popular options that can help you find the perfect fit to upgrade the flooring in your home. Towards the bottom of this article you can find a comprehensive buyer's guide which outlines the various types of wood and their advantages or disadvantages. If you're looking for an option with rich, warm coloring and a smooth, pre-finished look then this is a great option. You get a decent amount of square footage per box, so you won't need as many as some other options in order to get your installation finished. You'll also have the ability to choose the installation method you think will work best. This flooring option offers a great look that many will surely love. The coloring is warm without being too dark or too light and it will surely add a nice touch to your home. You'll also have multiple methods to get it installed, which is great because you'll have options that suit any experience level. The thickness is also decent and will work well with an underlay if you choose to use one. The multiple installation methods allow you to choose whether you want to call in a professional, go for it with nails or glue, or make use of the easy floating-floor option. It may be a good idea to get advice on the best way to install it over various surfaces for the best result. Overall, it comes with a great look that many will surely enjoy once they get the hardwood into their home. Depending on the installation method you choose, it can wind up being a more difficult process than you might expect. Keep in mind that on certain surfaces, you may want to use an underlay which can add to the overall cost. For those who want something that is more uniform, this may also not be the look you're going for as it tends to be more abstract. Another fantastic option is the Uluru wood flooring. This is a solid option that may be more expensive than many others, but the overall look is quite impressive. Those who are willing to spend the money often find that the price was well worth it due to the value they receive. This isn't just hardwood, but engineered hardwood which means it's going to be more durable and less susceptible to common types of damage. 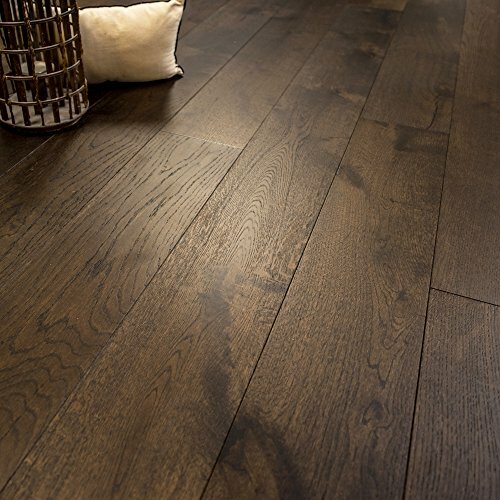 It's a highly authentic look with planks that are a manageable size and capable of creating a great result. You can also choose the installation option that suits you best from nail-down, glue-down and floating floors styles. This flooring is made to be lasting and durable, so you can upgrade and not have to worry about buying yet another new floor for many years. The overall look is really great and can certainly brighten up any space that it happens to be in. The choice of installation options allows you to get something that may work better for your home or choose the one that is best for DIY purposes. 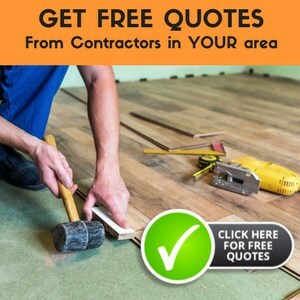 You may find that this flooring isn't as thick as other options, which can sometimes result in more potential damage being caused during installation. 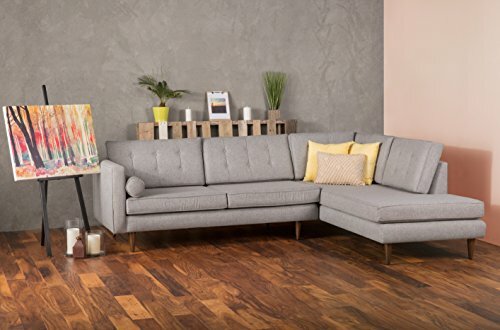 Also keep in mind that this is one of the more expensive choices out there, so make sure to try out a sample and ensure it's exactly what you want before making an order for a larger space. If you're looking for something with a unique color, this is the way to go! 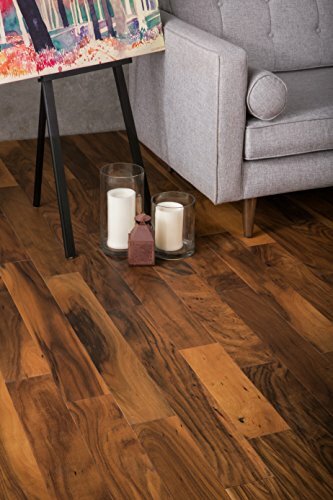 The reddish tone of this flooring is sure to bring a splash of color to any environment it's used in. It's also made to be hard, durable and attractive to all who come into contact with it. Many find this to be a fantastic choice for those seeking a warmer tone to their flooring. It's also offered in a great level of thickness that can ensure minimal installation waste. Though the nail-down process can be tricky, it will be well worth it once you see the results this flooring can bring. Due to the pre-finished design, it has a highly polished, smooth look that's sure to impress. Not only does this flooring option have a great look, it's also made to be very durable and smooth. That way, you won't need to be as concerned about the possibility of this flooring being damaged through common means. It's also going to be more likely to provide a lasting option, meaning you won't have to replace your flooring again for many years. This flooring is mainly installed using the nail-down method, which can be a tricky one for those who are seeking to do it themselves. It's more likely this would be a better option for those planning on using a professional installation. In addition, it may be more expensive than some other options out there so make sure you keep your budget in mind! If you're interested in a darker wood option that can be installed in a number of ways, this is a fantastic option. It is one of the more expensive methods, but it backs the price up with a great look and customer service that many enjoy. This flooring offers a decent amount of thickness, making it easier to install with a minimal amount of waste due to damage during the process. The planks are uniform, and the finished appearance is sure to impress. To ensure that you are happy with the flooring you choose, you'll also get a 30-year warranty that will keep you safe in the event that there are any issues with the flooring. Many customers have claimed that on top of the great look of this flooring option, they also receive excellent customer service from the manufacturer. That just goes to show that they understand that great service is just as important as a quality product. The installation method options make it easy for just about anyone to get the flooring installed easily. It's important to take your budget into consideration as you shop, as that will be able to guide you through the options that will work for you. As such, this is one of the pricier options on this list, so it may not be suitable for all customers. Some of the installation methods, like nail or glue options, can also be messier and more complicated. If you are renovating your home, choosing the right type of flooring for your home is one of the biggest decisions you will make. If you have decided on classic hardwood flooring, you may think that your choices are over. However, this isn’t the case. There is a range of different options you need to consider when choosing the best hardwood flooring for your home. Traditional hardwood flooring was produced using solid and thick planks of timber. Hardwood flooring produced in this way is still available today, but manufacturers are increasingly offering engineered hardwood flooring. Engineered flooring is produced using a thin layer of hardwood which is bonded with multiple layers of ply. These layers help to prevent the flooring from shifting position as it contracts and expands in response to environmental conditions. Engineered flooring is perfect for installation in apartments and basement flats which have concrete floors. If you install solid wood flooring onto a concrete floor, it will need to cushioned by a layer of plywood which can raise the height of the floor and cause doors to jam. Engineered flooring can be installed directly onto a concrete surface, removing the possibility of this issue. However, one drawback of engineered flooring is that, because of the thin top layer, it cannot be sanded and refinished in the same way solid timber can. This means that if you scuff or scratch engineered hardwood flooring, it is likely you will need to replace the damaged section. With solid hardwood flooring, you can buff out damage and refinish the surface, so it looks as good as new. Planks of hardwood flooring can either be purchased with an unfinished raw surface which is finished by a contractor after it has been installed or pre-finished with a topcoat and staining already applied. The major advantage offered by pre-finished wood is that you can be certain of how the finish will turn out and you can use a sample of the flooring to co-ordinate the rest of your home’s decor with the colour of the wood. Pre-finished hardwood flooring can also be install at a greater speed compared to solid wood flooding because there is no need to apply layers of staining and sealant. If you chose site-finished flooring, you run the risk that the colour and finish of the flooring will not turn out as you hoped or expected once the staining has been applied. However, site finished flooring does allow for a greater level of customisation, as you can choose the exact shade of stain you wish to use. There is a wide selection of finishing products on the market, including penetrating oil, polyurethanes, and UV-cured urethane finishes. However, whichever one of these you chose, the choice is really between a polyurethane or oil finish. Oil will penetrate deep into the wood, creating a natural, matte and soft look. However, an oil finish is much more likely to be damaged when compared to flooring which has a polyurethane finish. When polyurethane sets, it forms a solid topcoat which helps to protect the wooden surface, making it much more resistant to any damage caused by wear and tear. However, while an oil finish may be damaged more easily, it is also easier to repair or conceal any damage when compared to polyurethane. This is because you can easily touch up any damaged areas of with fresh oil, whereas a damaged section of polyurethane finished flooring will need to be replaced. Oil finishes are easier to maintain. However, you will need to carry out this maintenance on a more regular basis. Whereas polyurethane is tougher and so it does not require as much care. You should carefully consider the advantages of the different types of wood which are available to you. Oak: White and red oak is a very popular choice for hardwood flooring, as it is extremely durable which absorbs stain very well. Oak also has a very attractive natural grain. Walnut: Walnut is also a popular choice. Although walnut is softer than oak, it has a deeper colour which can make it ideal for a room in which you want to achieve a darker, richer, finish. Ash: Ash is a light coloured wood, which is extremely tough. It is the ideal choice if you need a hardwood floor which can sustain heavy use. 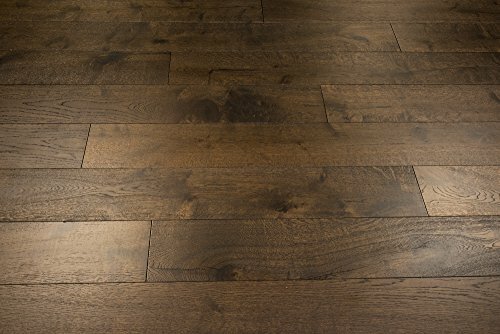 Hickory: Hickory is the perfect choice if you wish to create a rustic look within you home. This versatile wood is extremely durable. However, its density can make it difficult to install. The way a log is cut can have a big impact on the grain. Wood which is plain sawn, rift sawn, or quarter sawn will produce very different grain patterns. Plain sawn wood: This will produce a standard wood grain look which will feature the familiar undulating patterns. Rift sawn timber: This will produce a linear and long grain which does not undulate. Quarter sawn planks: These have a similar grain to those that have been rift sawn, but with the addition of rays of grain which reach out across the wood. The majority of hardwood flooring is plain sawn. If you wish for your flooring to be rift or quarter sawn, you may need to have it cut as part of a bespoke order at the wood yard. Traditionally, hardwood flooring is supplied in strips which are two or three inches wide. However, planks with a greater width are becoming increasingly fashionable in many modern homes, with some homes being floored with planks that are seven inches wide. Wide flooring planks can help to create a sense of luxury. However, if you opt for wide planks, you should be aware that they may be more susceptible to the effects of the expansion and contraction of the wood. Following these tips will help you to choose the perfect type of hardwood flooring for your home. 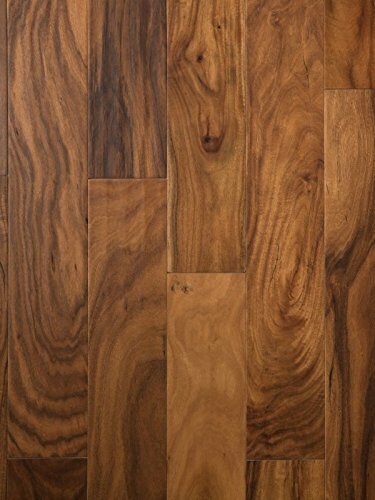 Hardwood flooring is 100 percentage natural material and it directly milled from lumber. It can react to changes in setting such as moisture and temperature, which may change shrink and expand. The solid wood floors cannot be attached with grounds or bathrooms.After tearing out that dirt-encrusted, coffee-stained, threadbare wall-to-wall carpeting, you realize that the underlying floor has also decided to go south. Seized by the desire to lay down some gorgeous hardwood flooring, you’re standing at your local hardware shop gaping at the vast array of options available. Luckily, you came prepared with this helpful guide. Hardwood flooring is a natural and quality products and it contain many options. They are follow. This type of flooring consists of single strips of solid wood cut to size. There are three types of this particular flooring: Strip, Plank, and Parquet. Solid hardwood flooring can come unfinished or pre-finished. Strip flooring comes in set widths and variable thicknesses. Plank flooring only comes in two thicknesses but the width can vary. Parquet flooring is made up of geometrical patterns made up of individual slats fastened together with adhesive or another fastening. Engineered hardwood flooring contains of three to ten layers asit called piles.Engineers install a wood in the ground level it is a great choice for the basements. The lamella is a layer of wood that is visible when installed a hardwood floors. Maximum engineer hardwood length is 5”/127mm wide and 7’/1200mm long. It is the universal use and dimensional stability.Engineered hardwood flooring installation is very easy as well easy to replace or removing the boards. It usually allows a floating installation process. 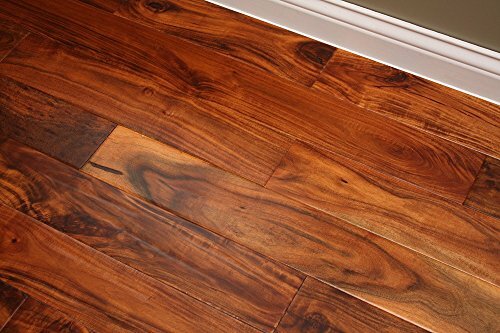 Engineered hardwood flooring is also suitable for the under floor and radiant system.When you want to install hardwood in your home or business you do the following process. They arejoining a board for one end with another end. The board fits directly into the groove, if fit into the modified groove, installing a click floor and make easy to replacement.This type of man-made flooring combines strips of real wood with those of other materials such as less expensive wood, plastic laminate veneer, or wood chip composite. These layers are glued together, usually with the grains of each layer perpendicular to each other to provide strength and resistance to warping due to moisture. Wood flooring is measured for hardness on the Janka scale. Janka scale measure woods like 11.28 mm (.444 in) steel ball into wood to half the ball’s diameter.Softer woods will have lower hardness ratings while harder woods will have higher hardness ratings. Red oak is more popular but is not as durable as white oak. Red oak has a warmer color while white has more burls and swirls. Oak resists moisture absorption and finishes well. This light brown wood has varieties that span the Janka scale. 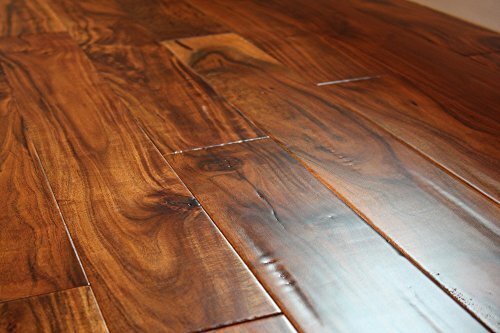 American and African Cherry varieties are too soft for an entire floor and are more appropriate for decorative and low-traffic areas. 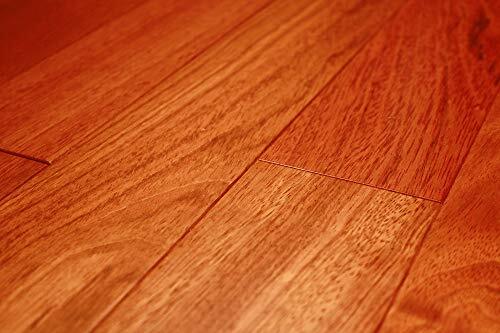 Brazilian Cherry flooring, however, has a Janka rating of 2350. This wood varies in color from light to reddish brown, appearing redder when exposed to sunlight. 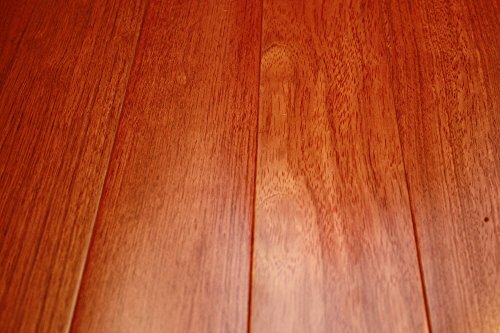 Brazilian cherry flooring resists warping and shrinking and ages well. This hard, dense and strong flooring has dark reddish brown to light brown coloring that is characterized by bark and mineral streaking. Mesquite tends to split easily but otherwise it is quite workable. Bamboo flooring comes in two main colors: natural, which is similar to beech, and carbonized, which is similar to oak. It is often considered the more eco-friendly of the woods due to its rapid maturation and for being a renewable resource. However, the use of certain glues in the lamination process and deforestation involved in planting some bamboo plantations offsets these claims. The beautiful dark reddish brown coloring and resiliency of mahogany flooring make it one of the more desirable wood floorings available. However, it is somewhat difficult to cut due to its hardness but it resists shrinking, warping and swelling. Mahogany is often used for high-quality furniture and boating. Although fairly soft, teak is easy to work with, has a beautiful grain with mellow gold to brownish-red hues, and resists fungus and insects. However, its long maturation and the limited places in the world where it can grow make it scarce and thus very expensive. 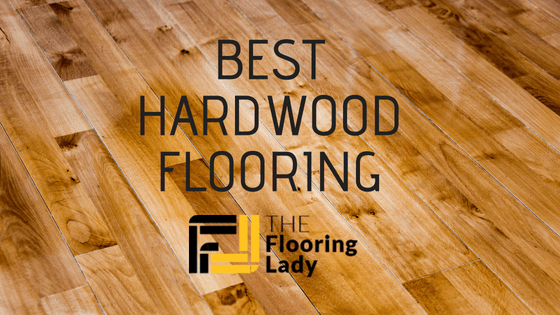 Knowing about the different benefits each type of hardwood flooring has to offer makes it much easier to pick the right type of wood for your home. For this article, the number one spot goes to the European French Oak Bastille Flooring. This is largely due to the fantastic overall appearance, versatility of installation methods, and inclusion of fantastic customer service. You really can't go wrong with this option. However, if it isn't quite the look you're going for then you'll surely be able to find what does work from the other options in this list. They are all highly rated and sure to make any flooring renovation look incredible when all the hard work is finished.